The primary driver of a player’s draft position is talent. But the most talented players aren’t always drafted first. Many factors unrelated to talent prompt teams to take a talented player off their draft board entirely. This year’s draft includes a long list of talented players who may be flagged as medical untouchables due to a single severe injury or a history of durability concerns. I don’t have any war room inside information and I obviously don’t have access to the extensive medical dossier each NFL medical staff puts together on every player of concern. But it’s fun to consider what teams may be thinking this weekend. So let’s estimate the likelihood of a medical red flag for many of the high profile players waiting to hear their name called this week. Remember, over half the league could red flag a player without affecting his ultimate draft slot. Not every situation will quietly turn into that of Da’Quan Bowers, whose knee injury was thought to be a worry in the days leading up to the draft but ended up pushing him from one-time consideration as a top ten pick to the 51st pick overall in 2011. Teams will assess each injury and the associated short and long term risks differently. For the purposes of this exercise, assume a flagged player may be considered undraftable by some teams or too risky to draft at a slot equal to his talent. Lattimore’s story is inspiring but may not keep him on every team’s draft board. Lattimore could be the most talented running back in the draft and may well be the first running back drafted. Lattimore can point to the recovery of Willis McGahee from a similar injury, his strong pro day performance and the hands of Dr. James Andrews as supporting evidence of a recovery that’s progressing well. The fresh memory of Adrian Peterson’s unbelievable recovery from an ACL tear will also quell the fears of some teams. 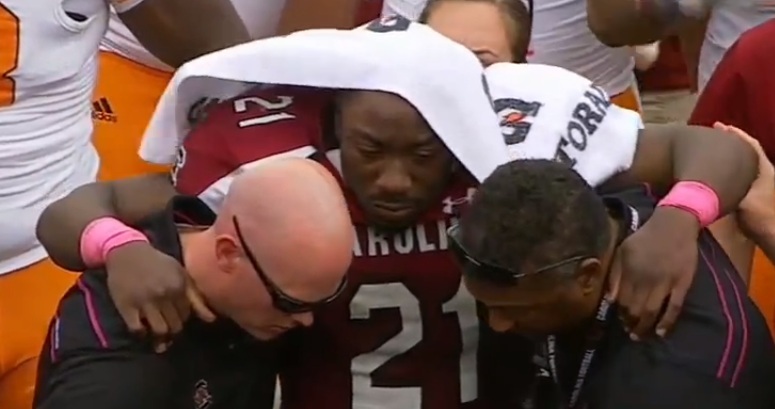 But Lattimore’s recovery is still unsure, he’ll enter the NFL with after tearing both ACLs and likely won’t be ready to contribute until 2014. The entire league is pulling for him – as evidenced by the ovation he received after his pro day workout – but that doesn’t mean he will be considered draftable by every front office. Jordan delayed surgery until after the combine to stay fit enough to perform nearly every drill (he missed the bench press). Teams had a chance to examine him and review his imaging studies before his surgery and again during the re-examination period in Indianapolis in early April. They also have enough tape to review from before and after his injury to make an informed decision. There’s a chance he’ll be flagged by some teams – labral injuries carry a risk of decreased strength and range of motion that could affect Jordan’s ability to pass rush. But there’s enough positive buzz on Jordan right now that I doubt the injury will cost him many, if any, draft slots. A torn labrum will concern teams looking at Milliner as a possible press, shutdown corner prospect. Recent reports that Milliner may not be ready for training camp due to rehab delays and that he’s had multiple surgeries during his college career (fixation of tibia, hernia repair, arthroscopic knee surgery) could also bother team medical staffs, especially if the knee scope was to address a significant meniscus or cartilage condition. Milliner’s talent should be enough to overcome these concerns, but there’s depth in the cornerback class and teams possibly looking to trade up in the first round for prospects at other positions. If there’s a sliver of doubt for those teams looking at Milliner, those factors could conspire to push him out of the top ten. Lotulelei was held out of the combine after testing showed his heart may not have been pumping normally. Additional testing was reassuring and Lotulelei’s pro day workouts were impressive. Even more telling to me, though, is that Lotulelei was not asked to return to Indianapolis in April for a followup exam. That suggests that the great majority of teams were comfortable with Lotulelei’s reportedly normal workup after the combine. If a team elects to draft Sheldon Richardson or Sharrif Floyd ahead of Lotulelei, it’ll likely be on the strength of talent evaluation rather than medical concern. There are degrees of spinal stenosis, as evidenced by the disagreement among the medical staffs at USC (where he wasn’t cleared to play) and Georgia. It’s likely that one NFL medical staff will have a different opinion on the risk associated with Jones than another. Two full seasons at Georgia without missing playing time will reassure some teams, but probably not all. Carradine would arguably be the best all-around 4-3 defensive end prospect had he not torn his ACL and could be on draft boards as a linebacker for teams that run a 3-4 front. 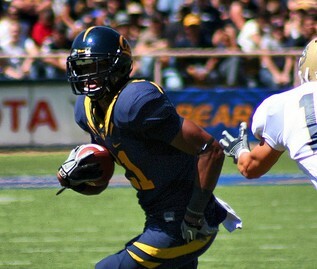 His 4.75 40-yard dash and pro day performance will reassure teams that his rehab is going well. ACL tears aren’t as worrisome as they used to be, but Carradine won’t realistically be a major contributor until late 2013 at the earliest and has only one season of tape to examine. Whether he’s reassured enough teams to crack the middle of the first round remains to be seen. There has been lots of positive buzz surrounding Hayden this week. I’m not here to be Debbie Downer, but Hayden’s injury was extremely serious. The largest vein in his body tore away from his heart. It’s an injury that’s seen with major trauma like car accidents or gunshot wounds and almost uniformly fatal. Doctors had to emergently crack his chest to find and control the bleeding, then repair a vessel torn so badly it was described as wet tissue paper. And he needed his entire blood volume replaced multiple times and lost 25 pounds before his recovery began. Hayden likely only survived due to his elite conditioning and a young, healthy, athlete’s heart. It’s true that Hayden is supremely talented and looks to be on his way to a full recovery. It’s also true that the injury is highly unlikely to recur. But this is uncharted territory for an athlete in a contact sport. Teams have taken players off their draft boards entirely for much, much less. The hamstring injury that kept Lacy from working out at the combine was reportedly of very low grade, but it was significant enough to limit his conditioning and ultimately affect his pro day performance nearly two months later. The hamstring isn’t likely to be a long term concern, but there may be questions about his slow recovery, motivation in rehab and whether he’ll be at a higher likelihood of future soft tissue injury. Barkley reportedly had a Grade 3 separation. It’s an injury that most quarterbacks would have repaired surgically, but Barkley – apparently with the blessing of Dr. Andrews – chose rehab over the knife. There were concerns about the strength of Barkley’s arm pre-injury, but he didn’t do himself any favors with an uninspiring pro day workout. The quarterback market is tough to figure this year, but I believe some teams won’t like the combination of average arm strength and any perceived risk in a shoulder that could have been surgically repaired but wasn’t. Allen could be flagged for ongoing knee or ankle concerns. Allen sprained his PCL in November but still wasn’t ready to run at Cal’s mid-March pro day due to persistent swelling in the joint. It’s also notable that Allen was asked to come back to Indianapolis in April for a medical re-check – but teams wanted another look at a previous ankle injury, not the knee. Allen’s game isn’t necessarily built on speed but two balky joints are likely to get him flagged by teams worried whether his short-area quickness will be affected. Rumors of issues surrounding his combine drug test won’t help either. Once all the pro days and medical rechecks and team invited workouts have ended, the time for misinformation and uncertain agendas begins. That’s not to say that every fire started in late April won’t burn a player’s draft stock to the ground. But this isn’t the time of year to find serious fault in every minor flaw. Teams doing due diligence should note that Warmack needed IV fluids during games and ask questions about his conditioning, diet, etc. But this isn’t something that’s likely to affect Warmack’s draft stock. Though he was fully recovered from his ankle injury last year, Davis’ durability reportedly remains a concern. Many draft observers don’t believe he returned to pre-injury form last year, but are split on whether it’s due to the ankle injury or evidence that he may never have been the elite talent some believed. The most recent offensive linemen who have tried to return from Lisfranc surgery (veteran Shaun O’Hara and 49ers’ 2012 fourth round pick Joe Looney) have been relatively slow to recover. How much those comps affect how teams view Jones isn’t clear, but it’s reasonable to expect that Jones will slip further than he would have without the injury. Smith could grow into an elite edge rusher, but he may not get the benefit of the doubt that a FBS player like Carradine (or even Lattimore) may get, especially if his surgeon and rehab team are considered unknown commodities by NFL medical staffs. ‹ More Surgery Necessary For Rob Gronkowski? Reblogged this on The Rookie Scouting Portfolio.